The Porsche 911 GT2 RS officially becomes the fastest road-legal car to go around the Buddh International Circuit. In November 2018, two of the fastest entities in India - Narain Karthikeyan and Porsche's 911 GT3 RS - came together to scorch the lap record at the Buddh International Circuit (BIC). Defeating the erstwhile lap record set by the manic Mercedes-AMG GT R by 2.2 seconds, the 911 GT3 RS had clocked an impressive lap time of 2 minutes and 7.629 seconds. Now though, just a few months later, another Porsche has stolen that crown from the GT3 RS - its elder sibling, the GT2 RS. 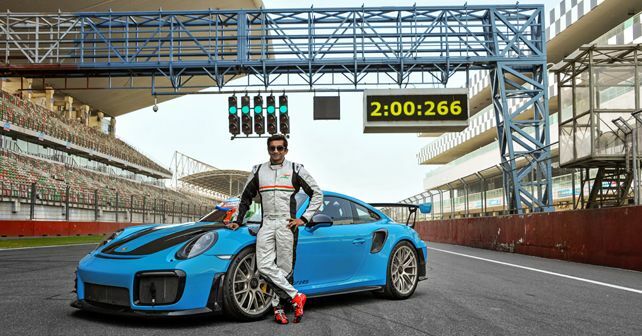 However, the GT2 RS was also driven by Karthikeyan, managing to clock a lap time of just 2 minutes and 0.26 seconds. This is a whole 7.36 seconds quicker than the GT3 RS, which isn't a slouch either. Thus, the 911 GT2 RS takes the crown for being the fastest road-legal car around the BIC, a feat certified by the Federation of Motor Sports Clubs of India (FMSCI). The Porsche 911 GT2 RS is powered by a 3.8-litre bi-turbo flat-six motor which produces a massive 691bhp and 750Nm of torque. Due to its weight of just 1,470kg, the GT2 RS catapults from 0-100km/h in just 2.8 seconds and can go all the way up to 340km/h, which puts it in contention with rivals like the Ford GT. All the power is sent to the rear wheels via a 7-speed PDK gearbox, which is a first for the current GT2 RS.